The Crimean War, or the Eastern War in Russian historiography, has filtered into western consciousness as a pointless, complex struggle, which bisected the long period of relative peace between the French Revolutionary Wars and the First World War. Remembered only for the heroic stupidity of the Light Brigade and the resourcefulness of one Florence Nightingale, the significance of events from 1853-56 for European history is often forgotten. In many ways, this conflict, which involved the French, British, Ottoman and Russian Empires, and stretched from Jerusalem to the Caucasus, is as endlessly fascinating as any other. Figes places great emphasis upon the religious motivations behind the war, especially those of the Tsar, in starting and in the prosecution of the conflict. Whilst this is arguable from the source material, it is difficult to accept religion was a determining factor in the policies of the French and British governments. More interesting is Figes’ exploration of Russophobia in the societies of the coalition, which is evident in contemporary and later accounts. It is because the Crimean War was the first major conflict that was extensively reported on and photographed that makes it so modern; it foreshadows the trenches of Flanders in so many ways. The inability of the western powers to transport and supply large armies resulted in thousands of unnecessary deaths through disease and malnourishment. Poor leadership and organisation caused more carnage, and whilst these failures were investigated, few lessons were learned for the future. Crimea appears a very nineteenth century conflict – a consequence of the great powers’ diplomatic brinkmanship gone awry, but it is more than that. It was evidence that the post-Napoleonic balance of power needed to be readjusted, and this process continued in further conflicts between the major powers across the continent. This effort to preserve a balance of power at the expense of regional and nationalist desires, and unwillingness to accept changes in the real strength of the emergent states, blinded politicians from allowing progressive change. Some states, such as Prussia, managed to redraw the map to their own design, while other peoples, in the Balkans in particular, suffered under the yoke of foreign regimes. These issues came to a head in the First World War, but they are evident throughout the long nineteenth century, and in the Crimean conflict. Figes manages to interweave the immediate factors with the broader consequences of the war. He focuses equally on the civilians, soldiers, officers, and rulers. The effect of the war on modern society, on the participants and those at home, is discussed with delicacy and awareness. Figes narrative is enthralling and moving, the chivalric truces are sharply set against the effects of new riflery technology, the incredible bravery against unforgivable inadequacy, and the tragic fate of the soldiers is depicted with true sensitivity. 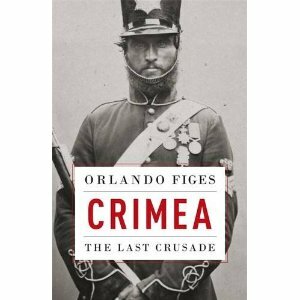 If the Crimean War had been forgotten, Figes has certainly ensured it will be remembered for a little while again. If you wish to purchase this, or any other of Orlando Figes’ work, please click here. booksexyreview Book reviews; literary fiction and non-fiction.